“Permaculture is a design system that focuses on meeting human needs – habitat, food, shelter, community, energy – while at the same time healing and regenerating the natural environment,” explains Joanne Blythe, a member of the Permaculture Research Institute of Saskatchewan (Permasask). “It’s a framework for developing solutions, for fixing what we’ve done wrong,” says Mark McLaughlin, Permasask. Bill Mollison, one of permaculture’s founders, describes permaculture as “a philosophy of working with, rather than against nature; of protracted and thoughtful observation rather than protracted and thoughtless labor; and of looking at plants and animals in all their functions, rather than treating any area as a single product system." Permaculturalists try to look at the big picture and to see how things are connected. Initial activities have focused on gardening because food is central to our survival and one way that people can take responsibility, relatively easily, for their own well-being. Garden designers take into account the local climate, water, and light, choosing plants that are well suited to the local environment as well as plants that grow well together. Permaculture principles can be applied broadly. When designing a residence, permaculturalists look at the placement and size of the house on the land, ways to reduce the ecological footprint of the house, renewable energy sources, rainwater run-off, root cellars and cold rooms to store food, a water tank for garden use or possibly drinking water, etc. They pay particular attention to placing the elements in relation to one another in order to enhance their functioning and facilitate the system functioning as a whole rather than as isolated, individual parts. In 2009, Ken McLeod took a two-week Permaculture Design Certificate course with Jesse Lemieux of Pacific Permaculture. Ken invited Jesse to come to Saskatoon in January 2010 to give a public talk and two-day introductory permaculture workshop. The events generated a lot of interest, so organizers decided to offer the full two-week course in the summer. Approximately 24 people attended the course, and some of them decided to start a group. The Permaculture Research Institute of Saskatchewan was officially incorporated in 2011 as a non-profit organization, and the group currently has over 50 members. They host workshops, film nights, monthly potlucks, and other educational events, as well as organizing permablitzes. Membership includes a discount on workshops, a 10% discount at Turning the Tide bookstore, and a monthly digital newsletter. The monthly potlucks are open to everyone – you don’t have to be a member – and there is usually a guest speaker. Recent topics have included urban beekeeping, native plants, water harvesting, and a seed exchange. 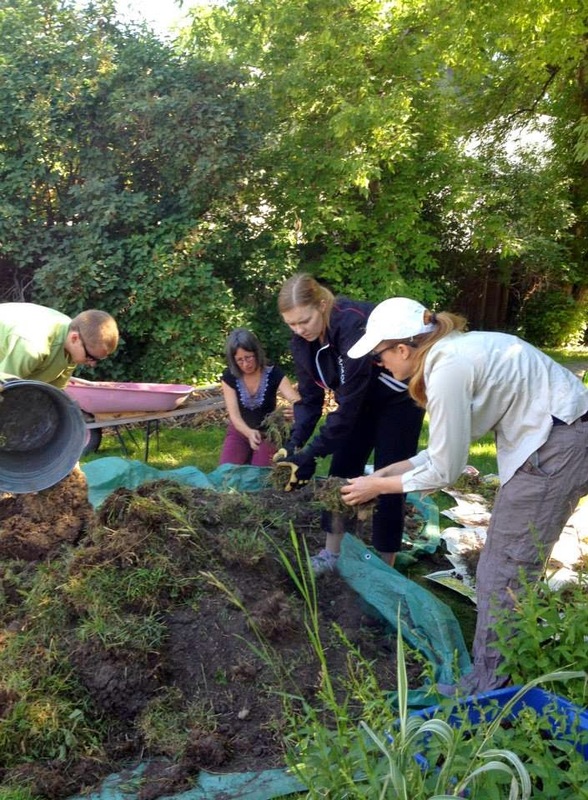 In March 2014, Permasask offered a two-day introductory permaculture course in Saskatoon. They are currently developing their own permaculture design certificate course. Instead of offering the course as a two-week block, which many people find difficult to attend, they hope to offer a series of weekend workshops, once a month for six months. This format has been offered successfully in other centres and constitutes the full 72-hour Permaculture Design Certificate course, in which each participant completes at least one permaculture design. Permasask holds several permablitzes every year. 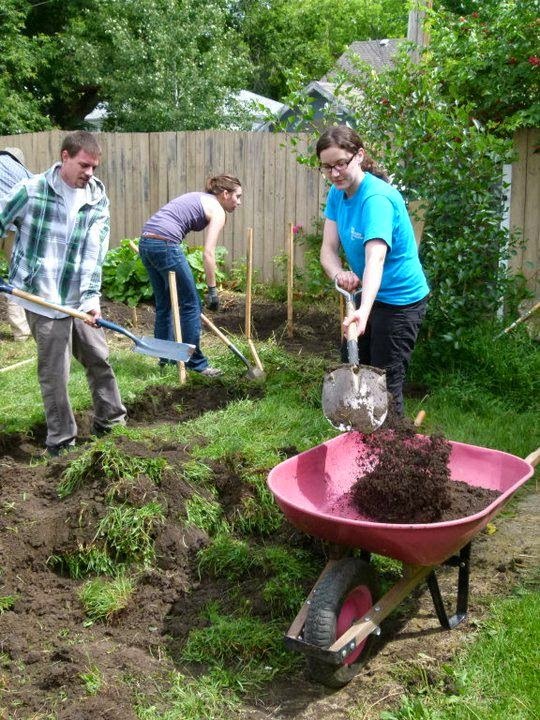 A group of people gather at a member’s yard to implement a permaculture design that has been prepared by someone who has taken the two-week permaculture design program. The design usually focuses on enhanced food production. The host, who must be a member of Permasask, provides lunch and supplies and agrees to participate in three further permablitzes. Permaculture has its origins in the intense discussions between a teacher, Bill Mollison, and a student, David Holmgren, in Tasmania, Australia, in the mid ‘70s. The men were looking for a positive direction forward and a concrete way to address the energy crisis and land degradation. Permaculture UK was founded in 1983, while the Permaculture Institute USA was founded in 1997. 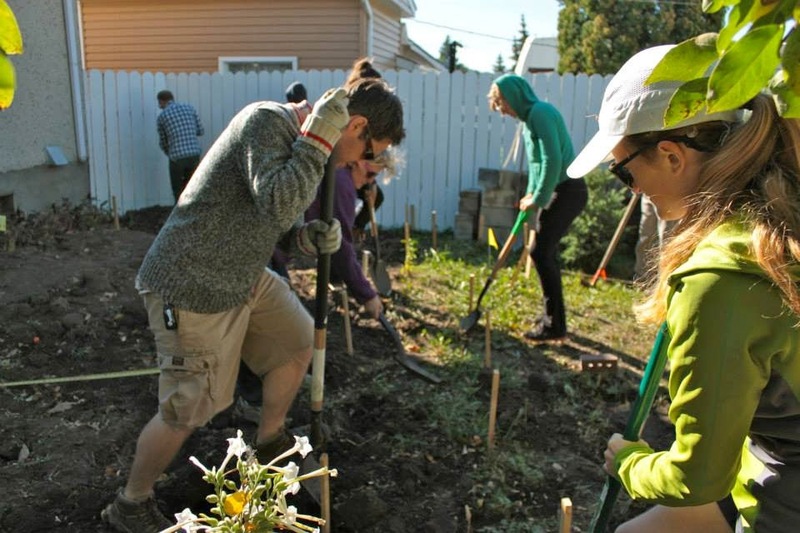 The permaculture movement is particularly active in Western Canada and three groups have strongly influenced Permasask. 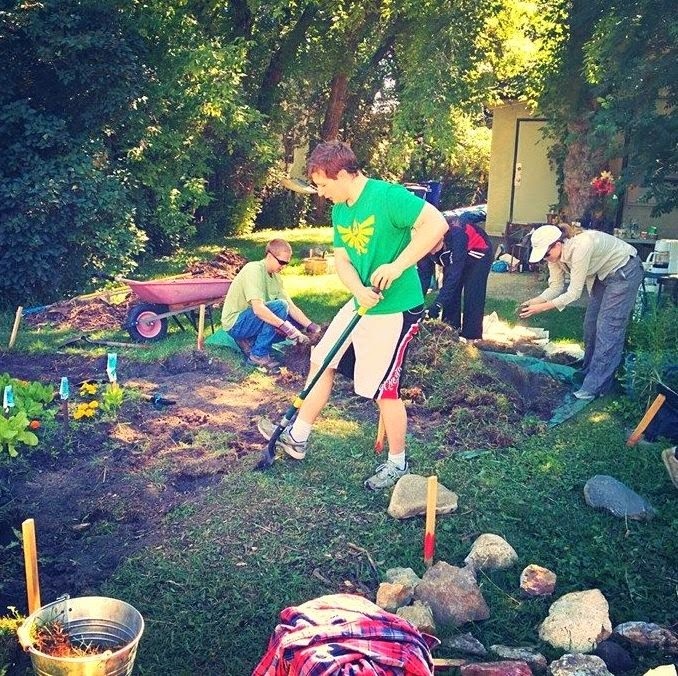 Jesse Lemieux, Pacific Permaculture, taught the first permaculture design course in Saskatoon. He offers permaculture design courses and consulting services from his base on Bowen Island, BC. Tayler Krawczyk, a graduate of the first design course in Saskatoon, was instrumental in establishing the Ness Creek Forest Garden, which incorporates chickens, a pond, an edible hedgerow, and a passive solar greenhouse. Tayler and Solara Goldwynn operate Hatchet & Seed: Edible Landscaping and Applied Permaculture out of North Saanich, Vancouver Island. Verge Permaculture is a Calgary-based company. Michelle and Rob Avis provide guidance on renewable energy solutions, ecological landscape design and regeneration, as well as offering permaculture design courses. As permaculture develops in a community, people branch out and develop permaculture-related businesses. The most common are permaculture design consultants and teachers, some of whom are listed in the previous section. This is just beginning to happen in Saskatoon. Happy Bug Farms is using permaculture principles to guide their farming practices. A Permasask member hopes to start a day care based on permaculture principles. The Transition movement, which is most active in the United Kingdom, was created by a permaculture teacher using permaculture principles and is a program for transitioning to a post-oil society. It demonstrates the full breadth of permaculture possibilities, from community-owned businesses and energy to local currency.